Messmer’s Wood and Deck Cleaner can be used to prepare old, weathered wood for prior to applying a stain, or as part of regular wood care maintenance to keep your deck, fence, log home, or other wood surfaces looking great. The Messmers Part A Cleaner is a concentrated wood and deck cleaner. Mix one 16oz container into 5 gallons of water. – Messmers Wood Deck Cleaner did a pretty decent job at removing graying and dirt. The cleaner restored the IPE deck back to a natural blond color. – The Messmers Deck Cleaner comes in a 16 oz container. This is half as much as similar powdered concentrates that come in 32 oz containers. 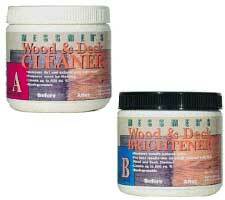 For example, you would need two Messmers ($19.99 x 2 =$39.98) Deck Cleaners to one Defy Wood Cleaner ($24.99). This still makes the Messmers a great buy compared to liquid deck cleaners.